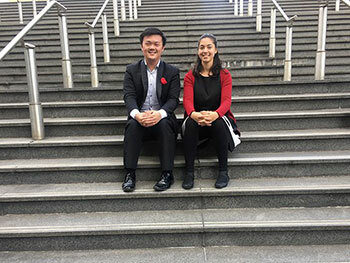 Violinist Usha Kapoor and Royal Birmingham Conservatoire postgraduate student Edward Leung have won the first Birmingham International Piano Chamber Music Competition. Performing works by Mozart, Adams and Saint-Saëns, Kapoor from Phoenix, Arizona and Leung from New York, fought off stiff competition in the new £57 million Royal Birmingham Conservatoire, part of Birmingham City University. The competition received 40 entries from 11 countries, with eight young ensembles eventually selected to participate and each giving a public recital, as well as taking part in masterclasses with leading artists. Lauded as one of ‘16 Incredibly Impressive Students at Princeton University’ by Business Insider while a student at the Ivy League institution, pianist Edward Leung has performed in concert halls across North America, Europe, and Asia. He is currently pursuing his Master of Music at Royal Birmingham Conservatoire with Pascal Nemirovski. Praised for her “confidence and bearing,” Indian-American violinist Usha Kapoor made her solo debut at age 17 with the Phoenix Symphony and has subsequently performed with the Culver City Chamber Orchestra, the Culver City Symphony Orchestra, and the San Bernardino Symphony Orchestra, among others. Kapoor and Leung received £4,000, a commercial recording with Resonus Classics and professional engagements at Wigmore Hall, Winchester Chamber Music Festival, Ulverston Festival, and Chamber Circle, Brussels. The jury comprised of Resonus Classics founder Adam Binks, pianists Katya Apekisheva, Daniel Tong and John Thwaites, violinist Michael Gurevich, violist Robin Ireland, and cellists Alice Neary and Christoph Richter. 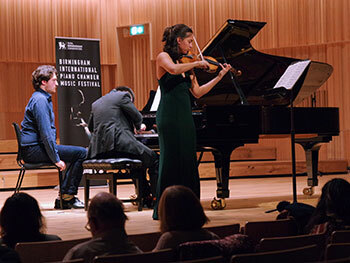 The competition was held as part of the inaugural Birmingham International Piano Chamber Music Festival, which saw 14 concerts and 13 masterclasses take place at Royal Birmingham Conservatoire between Tuesday 20 and Friday 23 November. “Chamber music is a multi-layered medium, in the wealth and depth of its repertoire as well as the skills and characteristics required to realise it. Royal Birmingham Conservatoire has put chamber music at its heart with inspiring results. “It is music for sharing, both with one’s performing colleagues and the audience, and is therefore somewhat confessional. It is open to wide-ranging interpretation, despite often being put together by composers with great intellectual rigour. The jury were delighted that Usha and Edward won the competition and it was extremely well-deserved. The music-making in the Festival generally was of an extraordinary standard, both from the young artists and the professional guests in the evenings. The final of the Birmingham International Piano Chamber Music Competition took place on Friday 23 November in the 500-seat Bradshaw Hall Bradshaw Hall at Royal Birmingham Conservatoire, live streamed by Classic FM. Following the success of this year’s competition, organisers are hoping to host the event again in 2021.